Each new chick gets a sip of water from the fount. I wrote about our brooder last week but at the last minute, Mom and Dad decided to make a bigger one for this group of chicks. That’s because each chick needs about 6 square inches of space for its first 2 weeks of life. Because Buckeye chicks are bigger than Mom’s old breeds, the brooder we had wouldn’t be roomy enough for our new additions. Dad made the new brooder on Wednesday, and Mom set it up on Thursday so it would be warm and comfy when the chicks arrived. Baby chicks need a safe, dry, draft-free home kept at a constant temperature of 95 degrees F for their first week of life, then 5 degrees F less heat per week until they’re 4 weeks old. 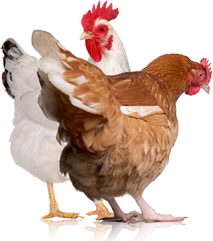 A warm, well-ventilated brooder is their perfect home. Our new chicks came in a box delivered to the post office. Mom put down old, short-napped dish towels for bedding so the chicks’ feet wouldn’t slip; she’ll replace the towels with dry wood shavings early this week. She also mixed sugar into their drinking water at 1/2 cup per gallon to give them a boost of energy and stored the covered jug on the counter so it would be room temperature (that’s what peeps prefer) when the chicks arrived. A nice lady at the post office called as soon as the box of peeps arrived. Dad drove straight in to get it. While he was gone, Mom filled the chicks’ drinking fount and placed small rocks in the drinking area so none of the chicks would accidentally drown. Then she scattered chick mash (that’s 20 percent protein chick feed from the feed store) on the towels on the bottom of the brooder. Our Buckeye chicks have feathers at 2 days old. It’s important to watch new chicks to make sure they’re okay and that the temperature in the brooder is just so. If they’re too hot or too cold, they peep real loud, and then you have to adjust the light. Cold chicks pile on top of one another right under the light to try to get warm. Hot chicks spread way out to the perimeter of the brooder to escape the heat. Happy, just-right chicks peep softly and race around their home or snooze. Snoozing chicks can be scary because sometimes they look dead! I’ll tell you more about baby chicks next week. They’re fun! 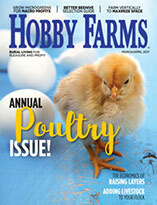 In the meanwhile, if you’re thinking of getting baby chicks and want to learn more, pick up an issue of Chickens magazine, a copy of the Popular Farming: Chickens magabook, or read some of the great articles about chickens archived on HobbyFarms.com. 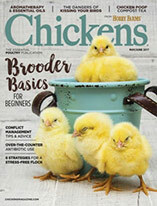 Carol Ekarius’ article “Chickens on the Farm” is very informative; Mom’s “Try Chickens” is a good one, too.